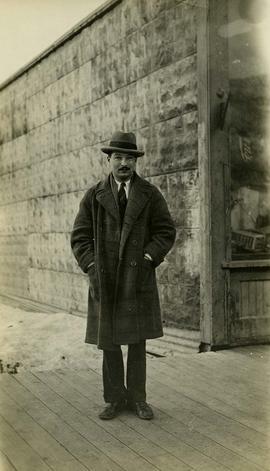 B&W print depicts Dr. Irving Snider posing for the camera on a boardwalk. B&W print depicts Dr. Robert Franks, Dr. Snider's partner. 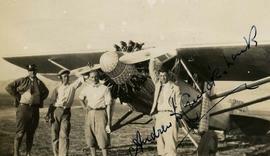 On the back of the image is written: "Dawson 1930". B&W print depicts Dr. Irving Snider and Dr. Robert Franks, Dr. Snider's partner, sitting on a walkway outside of their dental office. On the back of the image is written: "Dawson City 1930 - Outside Office". B&W print depicts Dr. Irving Snider and an unknown man posing in front of a doorway. The sign over the doorway reads: "Licensed to Sell Beer". "Dawson Outside" is written on the back side of the image. B&W print depicts Dr. Irving Snider and an unknown man posing on a hill holding onto wires. "Dawson, Y.T." is written on the bottom of the image.Note: colour adjusted on jpg. Colour Ektachrome 35mm slide depicts a dredging mining operation with Irving Snider and other unidentified men.Note: Colour adjusted on JPEG. B&W print depicts Dr. Robert Franks, Dr. Snider's partner, posing on a bridge. On the back of the image is written: "Franks [?] Bridge Dawson". The name of the bridge is illegible. Colour Ektachrome 35mm slide depicts a man standing next to a red bus at a ferry station, part of Dawson City, Yukon.Note: Colour adjusted on JPEG.